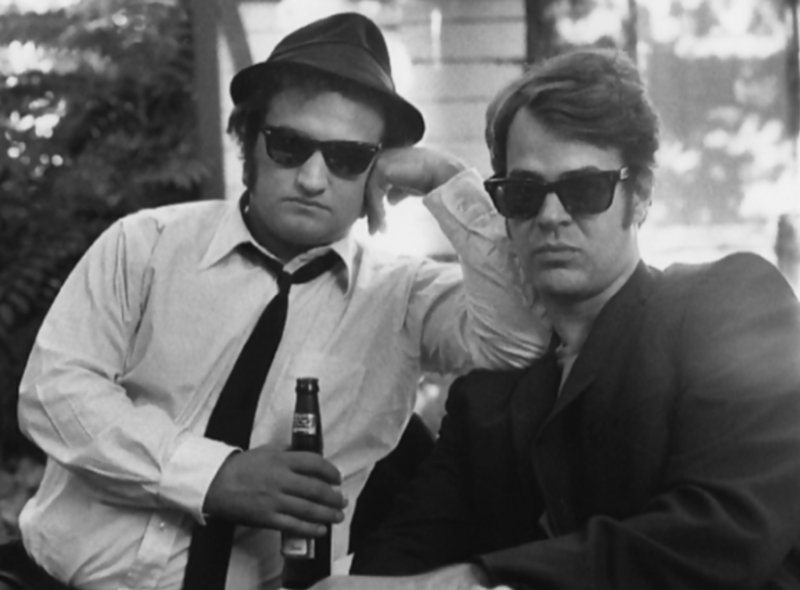 If Aykroyd & Belushi Are The Future Of Laughs, Why Are They Singing the Blues? It started as a joke, the kind of edgy put-on that made John Belushi and Dan Aykroyd the primus inter parodists on NBC's Saturday Night Live. To warm up the studio audience before air time, Belushi and Aykroyd donned baggy black suits, Ray Ban shades and porkpie hats and came out croaking R&B classics like Sam and Dave's Soul Man. They called themselves the Blues Brothers—but it hardly mattered if it was Rhythm & Blues or Rye & Bologna. Either way you sliced it, they were pure ham. Three years later, however, the Blues Brothers are part of the Gross National Product. The surly siblings are the impetus of one of the costliest movies ever, a double-platinum LP (Briefcase Full of Blues), a 25-concert summer tour and assorted books, buttons and T-shirts. Somewhere between Abbott & Costello and Cheech & Chong, Belushi & Aykroyd have parlayed their genuinely fraternal relationship into one of showbiz's most lucrative comedy partnerships. In a depressed movie market, and despite some reviews that suggested that their insult humor was directed mostly at the audience, they are taking in $1 million per day. The soundtrack album and a single, Gimme Some Lovin', are both bulleting up the charts, and during their tour (wrapping up this week) they recorded a third LP. The shtick's success also amounts to a professional vindication for the two actors, who until recently seemed to be carrying a briefcase full of boos. Both of them stiffed out badly last year in Steven Spielberg's megaflop, 1941. (On his 31st birthday in January, Belushi was presented by friends with a black button inscribed JOHN BELUSHI, 1949-1941.) Then came the alarmist early reports from the Blues Brothers' Chicago location, where director John (Animal House) Landis had decided to pump up Aykroyd's script (his first) with so many gratuitous car-crash scenes that the pay roster topped 12,000. As the film's budget bloated past $30 million, Hollywood wags joked, probably unfairly, that the movie really cost only $5 million; the rest went up in coke. Others found the budget less impractical than immoral. "The film is solid entertainment for your dollar," snaps Aykroyd, 28, comparing the cost to the federal subsidy for the 1980 presidential campaign. "They'll give $29 million to Carter and Reagan. I think we'd be hard pressed to find a smile in either of those places." Belushi seconds the notion, reasoning: "The F-14 costs about $30 million—no laughs there." What really makes them seethe are digs from music purists charging that the Blues Brothers don't play the blues, they desecrate them. Several critics labeled their onscreen antics as patronizing and insulting to the black performers (Ray Charles, Aretha Franklin, Cab Calloway, among others) in the movie. But James Brown, who does a stirring gospel number, disagrees. "The film was made with a lot of love and gave us all another chance," says Brown. "I hate to admit it, but these young people never heard of me. They come to the movies to see Belushi and Aykroyd, and they see James Brown and Aretha Franklin. If they like us, maybe they'll come hear us play." Even the most bitter detractors of the concept concede that the Brothers have recruited a backup group of nine of the best bluesmen alive. John and Dan personally ponied up an additional $50,000 to cover the difference between the Atlantic Records advance and the cost of their first LP. Whatever their intentions, it is clear from any Blues Brothers concert that there is more to the act than the music. Their manager, Bernie Brillstein, recalls the night two summers ago when they opened for Steve Martin at the Universal Amphitheater in L.A. "Belushi said, 'I make the best entrances since Durante,' " recalls Brillstein. "He came out and did two cartwheels." Then Aykroyd came out, his briefcase handcuffed to his wrist. "It was all over," adds Brillstein. Even Martin had a difficult time following. Such praise and success ought to mean satisfaction for John and Danny. But noooooo, as Belushi might bellow in his Saturday Night Live trademark. In public these days they are often as moody and defensively wary as a Sinatra. Admits Brillstein: "They work hard and worry a lot for people who are supposed to be so funny." Both Belushi and Aykroyd are fiercely protective of their working and personal relationship, which seems to transcend rivalries, sibling or otherwise. At the end of their New York promotion rounds for the movie, Belushi plopped his portly proportions (200 pounds on 5'9", at last count) on a couch and looked visibly worn. Aykroyd entered, more bummed than Belushi. To break the silence, Danny asked sheepishly: "Are you mad at me?" John shook his head: "No way. How about you? Did I take too much credit? Did I contradict you or cut you off?" Each worried that he might have unintentionally slighted the other. Interestingly, it was Aykroyd, the Canadian, who first discovered American blues. Born in Ottawa, Dan picked up blues harp at 17. Like Belushi, he had a strict Catholic upbringing. Dan recalls that he and his younger brother, Peter (later an SNL writer himself), received belt whippings from their "parental unit"—a civil engineer father of English descent and a Norman French mother. He was bounced from one high school and later dropped out of Ottawa's Carleton University, preferring to work as a surveyor and train brakeman. Eventually he and a friend opened a gin mill called Club 505 in Toronto. Dan ran the bar after 1 a.m., but early in the evening would do comedy at an improv club, where he met John Belushi and Bill Murray. That led to New York and an audition for SNL. Belushi's path to SNL was equally circuitous. The eldest of four children of Albanian immigrant parents (his dad ran several Chicago restaurants), John graduated from Wheaton Central High School, but most of his energies were expended on music (he played drums), mischief, school shows and football. After two semesters at the University of Michigan, John opened his own club in Chicago and later joined the Second City troupe. Then in 1974 he went to New York for a National Lampoon show and attracted the attention of SNL producer Lorne Michaels. In New York, John and Dan were instant soul mates. "We had a bad attitude," admits Belushi. "Ultimately that's why Lorne hired us," counters Dan. "He knew we'd fight him every step of the way for things we believed in." Soon the two were inseparable, typically taking off for a week to drive cross-country and to create new characters. It was Dan, for example, who concocted the Coneheads. During one such trip, in Aykroyd's Oldsmobile Rocket 88, he turned Belushi, heretofore a fan of Led Zeppelin and Grand Funk Railroad, on to the blues. "I would say, 'Hey, listen, have you heard this Sam and Dave tune?' " Aykroyd remembers. "It changed my life," Belushi adds. "As a white kid from the suburbs you just didn't go into neighborhoods where blues was. I didn't like disco, and I was getting tired of rock. I mean, how many Rod Stewart albums can you buy?" They still take trips, but now mostly in the twin Mercedes 280-C coupes they bought last year for $26,000 each. They also purchased two homes on Martha's Vineyard—Dan's cost $500,000, John's $435,000. Both have apartments in New York's Greenwich Village, not far from the private bar they have built to give themselves a protected place to booze and groove to the jukebox with friends. "Coming off the highway from the airport, I don't go to my apartment. I go to the Blues Bar first," says Aykroyd. "It's really soothing in there. I sit at the bar and watch the Cronkite news." Aykroyd dates quietly—his escorts have included Carrie Fisher, singer Nicolette Larson and most recently Californian Ann McAuley. Out of character as it seems, Belushi has been happily domesticated with Judy Jacklin, a designer and writer (she did Blues Brothers Private), for eight and a half years, three and a half of them wed. "It's been as a whole a very romantic time, with an occasional not-so-great day," says Judy, who travels everywhere with John. "Even if it's a hotel, at least we're waking up in the same bed in the morning." Work is still taking precedence. Dan is writing a spy movie and possibly a Blues Brothers sequel. John has lined up an adventure film, The King Pin, for next year, and there is always the music. "I have more fun in front of the band onstage than anything else I do," says Belushi. He and Dan turned down probably $3 million apiece in movie offers to tour with the band this year. What it has meant to their lives, though, is also sometimes a mixed bonanza. After a recent Today Show appearance at NBC's New York studio, Belushi spotted an old security guard pal and hit him with a well-placed tackle. When the two finished their mock wrestling, they embraced. "Well, John Belushi, how ya been?" shouted the guard. "Fine, Sam. How 'bout you, buddy?" returned Belushi. They lunged into another bear hug. Later Belushi said goodbye sadly. "It's hard just to screw around," he murmured, articulating a particular brand of the blues he and Dan are learning to live with these days. They don't want to become the new American heroes? "No," says Belushi. "We'll leave that to Bruce Jenner."